I have been trying to “use stuff up” instead of creating new backgrounds or more felt. I have a bunch of pieces of fabric and felt that need to be used for something. So I am working on doing that this year. I decided that I wanted to have a hand stitch project going all the time so that I have that to work on when I have a moment or two. 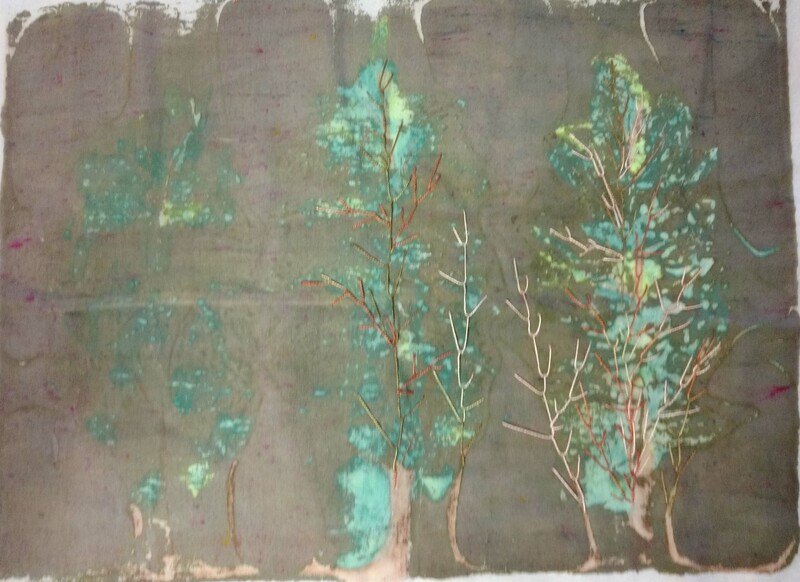 One of the pieces of fabric that has been hanging around is a deconstructed screen printed fabric that Louise created. 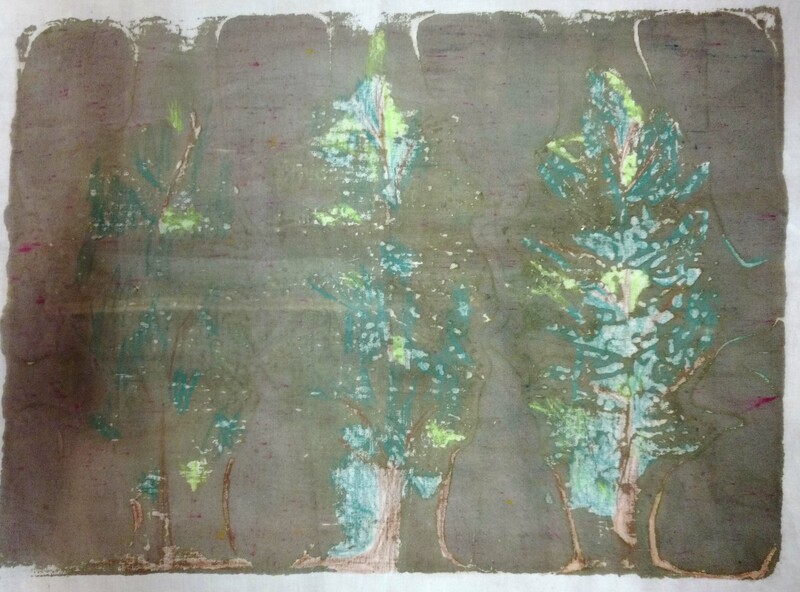 We had decided to use grey dye when screening. That was a mistake! It was pretty ugly. Louise gifted me the fabric and it’s been sitting in my studio for months. So it is the new background for my hand stitch project. I added another piece of fabric behind as it was lightweight cotton. I forgot to take a photo of the fabric before it was painted. It looked like trees to me (everything looks like trees to me) so I painted in the white areas with watercolors. This is what I had at the moment when I was painting. I might have chosen a different medium but it worked fine. And it will mainly get covered. The fabric looks better already! Next I started adding feather stitch with a multi colored pearl cotton that I dyed myself ages ago, another good “use stuff up” option. You can enlarge the photo to see the stitching better. I was originally thinking they would be fall trees but I have decided on a variety of green. I have started to add dark green on the right hand side. I am planning on piling all the stitching on top of each other so it will be a while before I finish this project. All of the trees will be multiple layers of feather stitch. It’s good to have something I can pick up easily and do a few minutes of stitching to get in my daily dose of fiber. Do you have a hand stitch project ready to go? It’s a great way to do a little fiber art on the go. I just put everything in a plastic bag with my needles and a pair of embroidery scissors and I’m ready to go. This entry was posted in Stitching, Surface Design. Bookmark the permalink. I have been following your blog for a little while snd find it very interesting. I wish i had a group like yours close to where I live (Ottawa, Canada). You see,s to have a lot of fun experimenting with your little group. Thanks for all the pictures snd explanations. Thanks Lorraine, I am glad you are enjoying the posts. We do have a lot of fun trying different techniques with my group. I started our group by asking people that I didn’t really know to see if they were interested. We got to know each other once we started meeting. Try finding others through local craft fairs, farmers markets or fiber guild gatherings. Lorraine there is the Weavers and Spinners group and the Out of the Box group in Ottawa. I think you could find lots willing to have a play group. Send me an email if you like. Looks great Ruth, I like the variegated stitching it randomises the colours nicely. I need to start a new stitching project. Thanks Ann, it kind of looks sad at this point in my opinion but with more stitching it will improve. I do like using the variegated colors for this type of project. Thanks for directing Lorraine to the groups in her area. What a great idea to use up what you have. I wouldn’t know where to start. 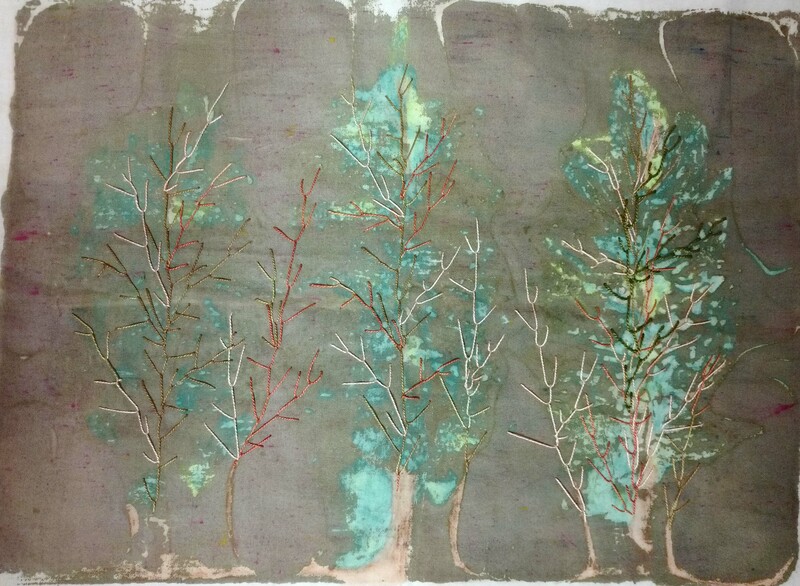 I look forward to seeing your progress with the trees with overlapping stitching. Thanks Marilyn, I am being overwhelmed by stuff so using what I have is definitely needed. It takes a while sometimes to figure out how to make the best use of something. An on-going project using stuff up….sounds ideal. Looking forward to how it develops. A felt panel from a recent workshop is another PINS piece….so I’m just waiting for the light bulb moment then it will be my ready to go project. It’s a good idea to try to use what you already have – tempting though it is to keep buying stuff for the stash. A slow project is satisfying and there’s a lot of promise in those trees. I have enough reels of thread to open a haberdashery shop, but when my mum needed a repair to her red jumper I didn’t have the exact shade and I had to go buy one! Thanks Veronique! I have used Derwent ink pencils on fabric with good results. I am not sure if the “chalk” you are asking about is the same thing. But you should try it on a small sample of fabric and see how it works. I embroider on lots of different surfaces and I don’t see why this wouldn’t work unless the “chalk” rubs off. I usually feel inspired to give it a go when I see your posts like this, but then I stare at something and just can’t think what to do/add! Zed, I usually decide on what stitch will give the look I want and then just pile it on. I have a lot of hand dyed threads to choose colors that will work. It looks pretty sad at the start but you just have to keep going.